Welcome to the Commonwealth! October’s ride will be a rollicking tour through Arlington, the Custis, W&OD, and Bluemont Junction trails. We will meet at the Courthouse Metro Station on the corner of Uhle and Clarendon Bvld. Parking is available at Courthouse and 14th. If you want more of a challenge get off the metro at Rosslyn and ride up the hill to Courthouse. Capital Bike Share is available on the corner of Veitch and Key Bvld (which we will pass on the way) or down 14th street from the metro station. Join us for the first of our indoor winter clinics! Please note this is event is free and open to all, and that you do not need your bikes. 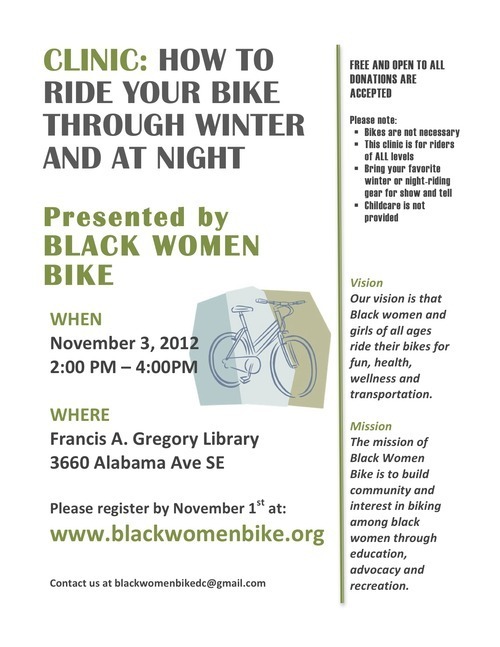 You WILL want to bring your favorite winter and night-riding gear to show off at our fashion show/ show-and-tell!